Welcome to June. I hope you had a beautiful holiday weekend and a tranquil return back to reality. This month I wanted to write about a topic that continues to come up for me and beg for attention, creativity. The above photo shows my creative Memorial Day space. While others were out biking, grilling, and enjoying time with family and friends, I was happy as a clam spending solo time with my art journal, yoga mat, books, and big bouquet of pink peonies picked up at the local farmer's market. My creative journey is unique. I've always been a bit, well, different. 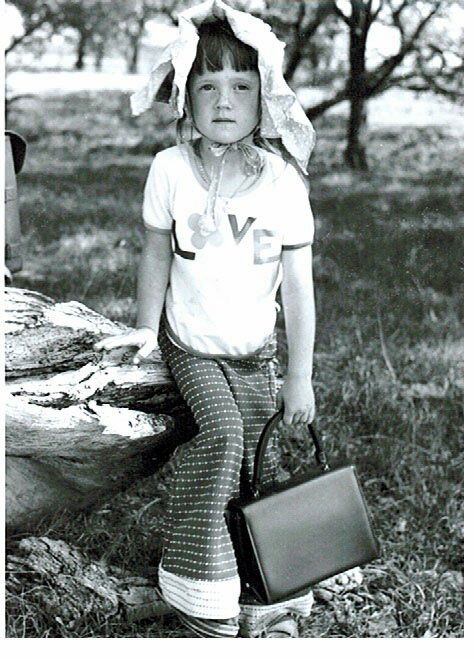 For example, here's a photo from my younger days hiking at my grandparent's Oklahoma farm with my "hiking purse" and bonnet worn backwards, of course. However, as I got older conformity became my norm until I read a book that changed my life, The Artist's Way. This book assures its readers that everyone is creative and encourages thinking about life differently. I began to and credit the launch of Tranquil Space in my fourth floor walk-up at 16th and U in 1999 to the work of The Artist's Way. Throughout my entrepreneurial and yoga journey, I've kept creativity close to heart. For example, during DC Yoga Week we pondered a fun gift for participants and decided upon wildflower seeds as a way to join the Guerilla Gardening movement. When coming upon the 10-year anniversary of Tranquil Space in 2009, I questioned the next decade and made a decision to return to school for a Master's in Social Work. And my latest creative endeavor includes offering the greenest option available in our boutique with upcycled items including vintage and reclaimed clothing. Creativity is one of Tranquil Space's core values and it is infused into each vinyasa class through the poses, music, sequencing, and readings we choose. Creativity fuels my soul and my yoga practice. Throughout the past 12 years of teaching, I've completed approximately ten teacher trainings from one month of Jivamukti to a week of yin with Sarah Powers to my 200-hr in Integrative Yoga Therapy and countless vinyasa trainings in between. I'm fueled by exploring, growing, and continually innovating. Considering my inability to practice yoga for six months (yes, six LONG months) last year due to a shoulder and hand surgery, my creativity has had to emerge as a tool for modifications and relearning old tricks in a new way with a different body ability. Ah, the lessons AND the creativity are ongoing. When pondering your own path and passions, I encourage you to explore ways to infuse creativity into your practice. Reread the above quote by Donna Farhi and note the ways in which you practice your yoga each and every day. Our ability to infuse daily interactions with passion (another Tranquil Space core value) and mindfulness can make even the most mundane tasks, such as eating a meal, a creative feast. Use your best china and family linens. Pick up a bouquet of flowers. Play music (Carla Bruni channel on Pandora is my lastest obsession). Lower the lighting. Savor the meal one mindful bite at a time. As Judith Lasater so eloquently says, "every moment of your life is a moment of potential practice." I encourage you to take time this month to explore your creative spirit. Infuse it with your daily practice of yoga on and off the mat. Pick up a new book (I'm loving The Art of Non-Conformity at the moment). Check out a local exhibit. Plan a bus trip to a nearby city. Visit DC's sewing lounge. Savor a picnic in Rock Creek Park. Try our yin, restorative or mediation classes to balance out your flow. Browse a bookstore. May June bring you mOMents of creative play infused with tranquility. You deserve it and your practice will thank you!